There's no reason to pay a tailor to mend your clothing. You can do it yourself, no matter what level of sewing experience you have. All you need are a few basic sewing supplies, a little of your time, and a good set of instructions. These ten repairs will have your wardrobe looking good as new in no time at all. Large holes require a patch, and there are two ways to do it. You can place the patch inside and try to match the fabric for a less visible look, or you can embrace the patched appearance with a brightly colored option that you applique outside. Either way, patching is a fairly easy repair. Cut the patch to be slightly larger than the hole. Typically, it's a good idea to make it one inch larger in both length and width. 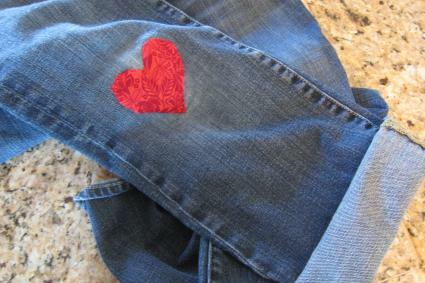 If you like, you can cut it into a fun shape like a heart or use an applique pattern to get a specific design. Place the patch fabric right side down on your ironing surface, and spray it with starch. 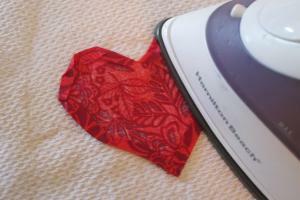 Carefully turn over the raw edges by a quarter inch, and use your iron to press them in place. The starch will make appliqueing the patch over the hole very easy. Adjust the embroidery hoop so it pulls the damaged area of your garment taut. Place the patch on the hole so it fully covers the area. Use pins to hold it in place. Thread your needle with a double length of thread and knot the end. Beginning inside the garment, bring the needle up through the garment fabric and the patch fabric, right at the edge of the patch. 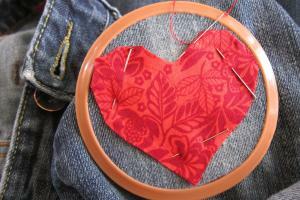 Use a slip stitch to applique the patch to the garment, keeping your stitches small and even. When you've gone all the way around the patch, knot your thread and cut it. Snags or wear spots are frustrating because they are only small blemishes in your otherwise sturdy garments. 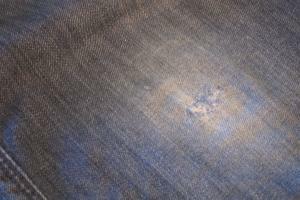 Fortunately, simple darning will help you repair these areas, making your clothing almost as good as new. Place the embroidery hoop around the torn area in your garment. You'll want the fabric taut, but you don't want the hole to be stretched open farther. Start by trimming loose threads and lining up the fibers in the cloth as much as possible. You'll be using the existing fibers as part of your repair. Thread your needle with a double length of thread. 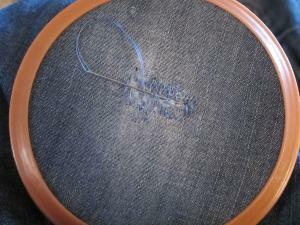 Depending on the fabric of your garment, you may want to use embroidery floss for the repair. In that case, use a single length. Knot the end of the thread. 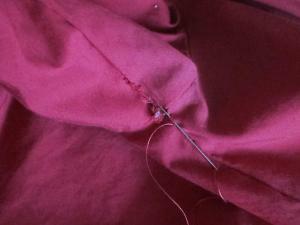 Beginning from the inside of the garment, bring your needle up through the fabric near the edge of the hole. Take a couple of very small stitches to secure it. Weaving your needle in and out of any existing fabric fibers, span the distance of the hole and bring the needle down to the inside of the garment. 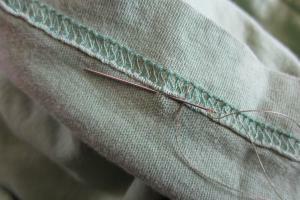 Take another small stitch and then repeat this process in the opposite direction. Continue until you have vertical threads going over the entire hole. Next, start this same process again, but go horizontally over the hole. Weave in and out of the vertical stitches you made in step five. Continue until you've created a closed area covering the hole. Tie off your thread and trim it carefully. Remove the embroidery hoop. Lost the button on your favorite coat or shirt? You can quickly and easily replace it yourself. Start by deciding if you need to buy a new button. If you saved the button that fell off your clothing or if you have a spare that came with the garment, you're already ahead of the game. If not, you can find a similar button at your local craft store. Simply measure the other buttons on the piece of clothing and purchase one that is nearly identical. It can help to take the garment with you when you're shopping. Close the garment, and use a disappearing fabric marker to draw a line through the buttonhole onto the button side of the clothing. This will help ensure that you place the button correctly when you reattach it. Thread your needle with a double-length of thread, and tie a knot in the end. Take a couple of stitches where the button will be located. This will help secure your thread. End with your needle on the back side of the garment. Hold the button in position on the garment with one hand, and with the other hand, bring the needle up through one of the holes of the button. Make sure the holes are aligned properly, and then bring the thread back down through the next hole. Don't pull the thread too tight. If you have a two-hole button, this is easy. If it's a four-hole button, you can choose to use the opposite hole to form an X with your thread or create parallel lines of thread. Continue sewing up and down through the holes at least six times. Next bring the needle up from the back of the fabric, but don't bring it through the hole in the button. Instead, wrap it around the threads beneath the button, called the "shank." Wrap it at least six times, and then bring the needle through the threads several times to create a knot. Test that the button is secure before you cut your thread. Sometimes, a loose thread or a sudden pull can cause your hem to fall down in a spot along the bottom of a skirt or shirt or the cuff of your pants. This is an easy repair, especially if you catch it early. Thread your needle with a single length of thread and tie a knot in the end. 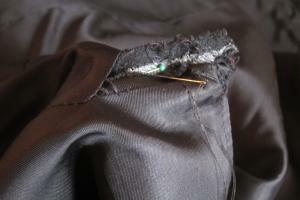 If the damaged area is extensive, you'll need to pin the hem to hold it in place. If it's just a small area, you can simply hold it with your fingers. Insert your needle between the folded area of the hem and the main part of the garment. Bring the needle up through the hem fabric, hiding the knot between the layers. You'll want your stitch to be about 1/8 inch from the edge. Depending on the type of garment, this may be a raw edge, or it may be a rolled edge. Bring the needle down through the main fabric of the garment, taking a tiny stitch and moving only about 1/4 inch from where you started. You'll have a diagonal stitch on the back of the fabric and a very small stitch on the front side. Repeat this process until you've closed the area with the fallen hem. Knot your thread and trim it. Everyday strain can cause on-seam tears in vulnerable areas of your clothing. 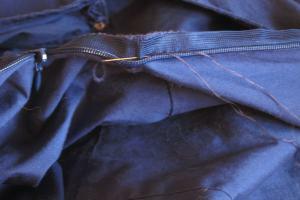 Fortunately, on-seam tears are some of the easiest clothing repairs you can perform. Start by trimming any loose threads in the damaged area. Thread your needle with a single length of thread that perfectly matches the fabric of your garment. Knot the end, and bring the needle up through the fabric on the inside of the seam. Turn the garment so that the finished side is facing you. Use a slip stitch to close the seam. 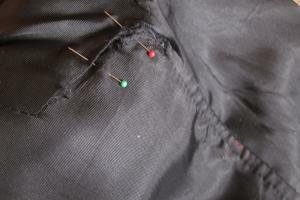 Start sewing before the damaged area, and pass the needle back and forth from the finished side. This will provide a neat repair, which you will strengthen in the next step. Unless you're dealing with a very large tear, you don't need to pin the area closed. The slip stitching does a better job of keeping the edges exactly where you want them. When you reach the end of the damaged area, bring the needle to the inside of the garment. Use a simple straight stitch and small stitches to reinforce the repair you just made. Tie off your thread and trim any loose ends. Zippers receive a lot of stress, especially where they intersect seams in dresses, pants, and other garments. 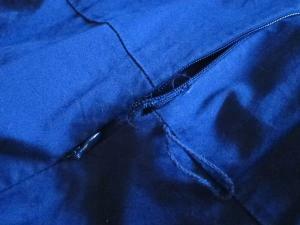 Because the zipper itself is stronger than the surrounding fabric, it can begin to tear out of the seam. You can easily repair this problem at home. Examine the torn area and clip any loose threads. These will look untidy, and even worse, they can interfere with the zipper's functioning. Thread your needle with a double length of thread and knot the end. Unzip the zipper and turn the garment so the zipper seam is visible. 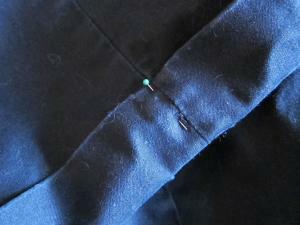 If the tear is large, use pins to line up the fabric of the seam and the zipper tape. If it's a small tear, you can simply hold it in place. Starting on the seam side rather than the zipper tape side, bring the needle up from the bottom. Do not sew through the front of the garment. Begin sewing small straight stitches up the zipper tape, keeping in line with the original stitches. When you reach the end of the damaged area turn around and sew back to where you started. Knot your thread and trim any loose ends. Turn the garment right side out and test the zipper for functionality. Cuffed pants and sleeves are usually held in place with tiny tacked stitches. Over time, these stitches can break, causing the cuff to droop unattractively. Luckily, this is a simple repair. Try on the garment, and use a pin to hold the cuff in the desired position. You may need several pins to hold up a larger cuff. Take off the garment and begin your repair. Use your tape measure to place the pins at even intervals around the cuff. Depending on the weight and drape of the fabric, you'll need to secure the cuff about every two to six inches. Measure to make sure the cuff is turned up evenly all the way around the opening. Thread your needle with a double length of thread that matches the garment. Knot the end securely. Starting from the inside of the garment, bring the needle up through the garment fabric so that it is now between the garment fabric and the cuff. Note that the cuff is two layers. Carefully take a small stitch through the inside layer of the cuff, right at the edge. You should not bring your needle to the side of the cuff that will be showing. Bring the needle back to the inside of the garment to complete the stitch. Repeat at least six times to create a secure tack. Trim the thread closely. Move on to the next pinned spot and repeat the process. Continue until you have tacked the cuff at each place you marked. The kick pleat on skirts and coats is especially vulnerable to tearing. Although this area is designed to provide ease as you walk, it often gets strained past the point where the fabric is able to give. This can cause a seemingly serious tear that you can actually fix yourself. Kick pleats are common on lined garments, and the tear usually goes through the lining and the main fabric. Start by turning the garment inside out and moving the lining aside. 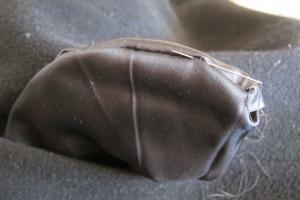 Use pins to secure the kick pleat seam in the main garment. Thread your needle with a double length of thread and then repair the kick pleat seam as you would a normal garment seam. Tie off the thread when you've finished. Tuck the kick pleat seam back inside the lining and pin the lining closed. Thread your needle with a single length of thread and knot the end. Use a slip stitch to close the tear in the lining. Knot the thread when you're done. If you've ever had a hole in your pocket, you know how annoying it is to try to fish loose change, keys, and other objects out from between the lining and exterior fabric of your coat or other garment. You can easily mend this type of damage to solve the problem. Grasp the fabric of the pocket and turn it inside out to expose the hole. Typically, the hole will be on the seam. Trim any loose threads. Thread your needle with a single length of thread and tie a knot. Hide the knot in between the layers of fabric, bringing your needle to the finished side. Take a stitch on the opposite side of the seam, slipping the needle in between the fabric layers. Continue doing a slip stitch to keep your work invisible and neatly close the pocket. When you're done, knot the thread and trim it then gently push the pocket back into place. Sometimes the drawstring on your PJ pants or sweatshirt comes free. There's no need to get out the sewing machine for this simple repair. 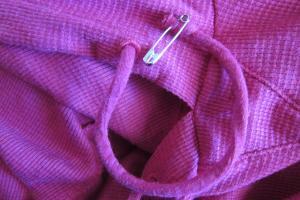 All you need is a safety pin! Choose one that will fit through the hole for the drawstring. 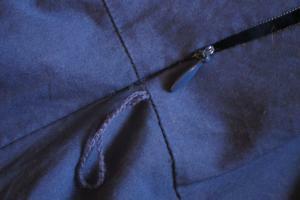 Open the safety pin and insert the pin portion through the fabric of the drawstring. You'll want to place it about 1/4 inch from the end. Thread the safety pin through the drawstring hole on your garment. Use your fingers to move the safety pin through the drawstring channel. It will pull the drawstring along behind it. When you reach the other hole, pull the safety pin out. Remove the safety pin and enjoy using your garment again. In many cases, repairing your own clothing is easy. Taking a few minutes to do some basic mending can extend the life of your wardrobe and save you money.